A small team of intrepid motorcycle adventurists have collected in Hanoi to start their two week expedition down parts of the former Ho Chi Minh Trail. The team is comprised of five avid adventure seekers, four from the USA and one from Germany. Included are a cameraman, two Vietnam veterans, one female adventurist and a moto-journalist. 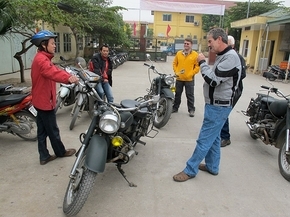 Over the next weeks the group of serious adventure riders will work their way south to arrive in Ho Chi Minh City January 26, 2011. They are riding "big bikes," former Russian Army 650 cc Urals that have been upgraded to 12 volt electrics, with solo seats, luggage carrying systems, disc brakes on the front and larger gas tanks. The BIG DOG VIETNAM EXPEDITION has been organized in conjunction with Explore Indochina and Great American Motorcycle Adventures/BIG DOG ADVENTURE RIDE. According to a January 12 statement, "We are piloting well-worn Russian Army motorcycles that can be likened to a 1970 John Deere tractor, really copies of an early 1940's BMW R51 motorcycle. The proposed route with take us through parts of the more difficult jungle riding areas in Vietnam where some of the most tenacious fighting took place during the American/Vietnam War. It will be interesting to see how the geography looks today, 40 years after that part of world history. The team is unguided and travels without a support truck or spare motorcycles. Part of the adventure will be to keep the machines and the team members in running condition on a daily basis. We came here from 1/2 way around the world not to have foil covered chocolates placed on our pillows at night, or have someone plan what they think we should see or do. All members of the team are experienced motorcycle adventurers, so that commonality should make extreme riding conditions more manageable." Due to the remote locations the team will travel through and to, reportage is expected to be intermittent. As the German adventurist stated, "I don't even check e-mail once a week when I'm at home." Once the team leaves Hanoi their electronic tethers will be severed. Rust colored mud. Deep tracks of the wet ugly stuff met the team as they flogged, flopped and dabbed their way thought thier fifth day. Recent rain had caused landslides, many knee deep across the roads. Through these flows of nearly fluid reddish dirt the team had to slip and slide oftentimes over 100 meters. Their heavy motorcycles loaded with luggage meant a errant dab could result in a broken leg or ankle if the front wheel went left while the rear wheel slid right using the driver's leg as a pivot. Hundreds of kilometers away from any clinic, deep in the jungles of Vietnam near the Lao border, a hurt team member would be days from the comforts of a Bangkok hospital or a Med Evac flight for life. Each team member knew an error would hold up the rest of the team. Each knew they were doing was dangerous, pushing the envelope of risk as far as it could be pushed. And yet, when the group stopped on a bridge over a clear flowing river to re-group, all they could do was laugh. Each had managed to conquer some of the ugliest sections of the Ho Chi Minh Trail, pushing their personal motorcycling skill envelope to the maximum while keeping the team in tact. When team member and Vietnam veteran Rene Dhenin's motorcycle would not start after a stop he thought "Oh s***, I'm going to be stuck out here in the jungle." His thought was a reflection of 1,000's before him when alone along the border of Laos nearly one-half a century before. To cheer him up as the electrical problem was being sorted out, one of the other team members said, "Rene, aren't you over here on this expedition looking for your dog tags, the ones you left on a bedpost in Nha Trong about 40 years ago." Dhenin stopped peering into the snakes of wires inside the headlight, looked skyward for a few seconds in memory, smiled and then said, "Back then some of the guys said a working lady cost $2.00." The team made it to Khe Sanh after successfully working their way in and out of a "closed" area to independant travelers, the secret of how they did it agreed by all to remain a secret. Fungus between the toes. The brownish stuff that itches and smells. If scratched the skin soon becomes infected and may result in amputation. In the case of our one team member who had not been attending to his feet after days of wet socks inside dirty shoes resulting in jungle fungus and smelly feet, a vote was taken amongst the remaining members to decide how to deal with his stinking feet. Instead, the team vectored 300 kilometers out of the jungles to Nha Trang where medicinal healing was done at a yuppie brew pub on the beach. Mr. Stinky Feet poured four different brands of swill into his abdomen and flushed the sandaled toes clean after an extended evening of self-medicating and dribbling urine on the toes each time he tried to hit a urinal. Three horrendous vehicle crashes were seen on the way to Nha Trang. One involved a new SUV that had to give way to an oncoming large truck. The SUV skidded and swerved to the right, then drove off the road into the ditch. The SUV flipped and landed upside down facing the direction from which it had been coming. The front seat passenger had his head squashed like a watermelon dropped from the 20th floor of a building onto the street below. His demise had been quick and messy, but likely he had not felt much pain, except for maybe the sense of a screaming migraine headache coming on in his last seconds. The driver survived but had the passenger’s gray brain matter and blood splattered on his face, shirt and pants. One of the team members stopped to see if help could be rendered. All that could be done was to give the driver rolls of toilet paper to dab red and gray matter off his face and clothes. Sleeping has been a mix ranging from a large one room “home stay” where all members slept on mattresses on the floor, to a three star hotel with WIFI, telephone in the toilet and a massage parlor attached for the single male team members wishing to pursue the delights of soothing pleasures after a hard day to jungle driving. Food has ranged from noodle soup to broiled salmon with one team member even trying “steak.” The steak was a small portion and likely from a retired rice field water buffalo. One evening the group had ordered noodle soup with beef, but the heavily seasoned beef tasted more like chicken than cow. After eating the fare, one team member said it was the village dog that had been run over by a passing truck or bus: well tenderized but not having any fat. He had also secretly noticed what suspiciously looked like a dog’s tail, feet and snoot in a bucket by the kitchen when he went to the toilet. The rest of the team howled at the thought of having eaten dog and tried to distance themselves from the possibility. The next day they were still trying to remove any thoughts of having consumed for dinner the night before Fido the dog, “man’s best friend.” However it was noted that day that when the team stopped along a jungle track to pass water each team member either sprinkled their motorcycle wheel or lifted one leg when making water on a tree. “Go back, be a man, clean up the situation” said the expedition leader to the team member who had hit a chicken in a poor mountain village near the border with Laos. The fowl had been no match for the left cylinder head of the Ural as it darted on to the road trying to commit “suicide by Ural.” The motorcycle driver clipped it, leaving it flopping in the road. Several villagers had seen the hit-and-run. They were standing in front of their house looking at the two team members who had stopped a couple hundred feet further down the road. The chicken was noisily flipping in the middle of the street, feathers flying. “OK, I’ll do it.” The leader turned the Ural around, drove back to the wounded bird and parked in front of the staring villagers. Calmly he got off the motorcycle, walked to the dying chicken, bent over, picked it up and wrung its neck. He coolly handed the croaked clucker and a wad of cash to the eldest of the villagers who accepted both with an acknowledging nod and a smile. The team ended their journey in Ho Chi Minh City. All agreed that the less than 200 kilometers they spent on the notorious Highway 1, clogged with buses and trucks, was the worst part of their expedition, especially the last 20-30 kilometers into Ho Chi Minh City. One member of the group found those final kilometers especially distasteful when a passenger leaned out a bus window as he was passing it and regurgitated, some of the passenger’s semi-digested rice and pork soup splattering on the motorcyclist’s unprotected face. Team members expressed their appreciation for the planning and assistance provided by the Hanoi based firm Explore Indochina and their expedition mechanic, “Captain Phu,” who expertly managed to keep the Urals running for the two weeks. Like many expeditions the BIG DOG VIETNAM EXPEDITION had been a memorable motorcycle adventure which included wild women, extreme danger, deranged gun guys wearing uniforms, some attempted and successful rip-offs and the setting of a classic globally lasting account. The recounting of those events and verisimilitudes will find placement outside these combat conditioned field reports where names can be changed to protect the not-so innocent.